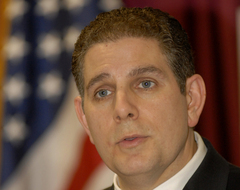 Lansing Mayor Virg Bernero is in the race for the Democratic Nomination for Michigan Governor. Today, he made an official announcement in Detroit and later in Grand Rapids, then Lansing. Wizardkitten has a great photograph and story here. Mayor Bernero's gubernatorial campaign website is here. Alma Wheeler Smith is also a Democrat seeking the Democratic Party's nod. Her official site is here. Update: Oh, And, Missing In Action -- Denise Ilitch.